​Liverpool host Chelsea at Anfield on Sunday afternoon as they continue their push for an first ever Premier League title. The Reds returned to the top of the tree last weekend after securing a hard-fought 3-1 victory away to Southampton, leapfrogging Manchester City. The Citizens have a game in hand, however, and will secure a second consecutive championship if they win all of their remaining fixtures. Late scores from Mohamed Salah and Jordan Henderson ensured Jürgen Klopp's men left St Mary's with all three points, midfielder Naby Keita earlier levelling matters after Shane Long had given the strugglers an unexpected lead. ​Chelsea, meanwhile, saw off ​West Ham United courtesy of an Eden Hazard double, the Belgian electrifying Stamford Bridge with a mercurial display. The 2-0 success took his team up to third in the table, though they have played a game more than their rivals for the ​Champions League places. Check out 90min's preview of the ​heavyweight clash below. Centre back Joe Gomez could make his first appearance in four months for the hosts after returning to the bench for Tuesday night's Champions League quarter-final victory over Porto. Fellow long-term absentee Alex Oxlade-Chamberlain is not expected to play despite nearing fitness following a serious knee injury last season. Adam Lallana is a slight doubt for the encounter, a muscular injury hampering the England international. He completes the list of injury concerns for Klopp, who has no suspensions to account for in this pivotal game. Marcos Alonso overcame a hamstring strain this week to score the only goal at Slavia Prague in the first leg of their Europa League quarter final. However, youngster Ethan Ampadu has a back complaint and will be likely out until the end of April. Like their opponents, Chelsea have no players suspended for Sunday's clash. ​Chelsea ​Arrizabalaga; Azpilicueta, Rudiger, Luiz, Emerson; Jorginho, Kante, Barkley; Willian, Higuain, Hazard. The points were shared in the last meeting between the sides back in late September. Daniel Sturridge whipped a delicious long-range effort into the top corner with a minute left of play to maintain the ​Reds unbeaten record. Hazard had earlier slid a low drive beyond Alisson, with that effort being his second in a week against the Merseysiders. Three days prior the pair had played against each other in the League Cup, the quicksilver winger jinking beyond several statuesque Liverpool defenders to secure his team's progression to the next round. 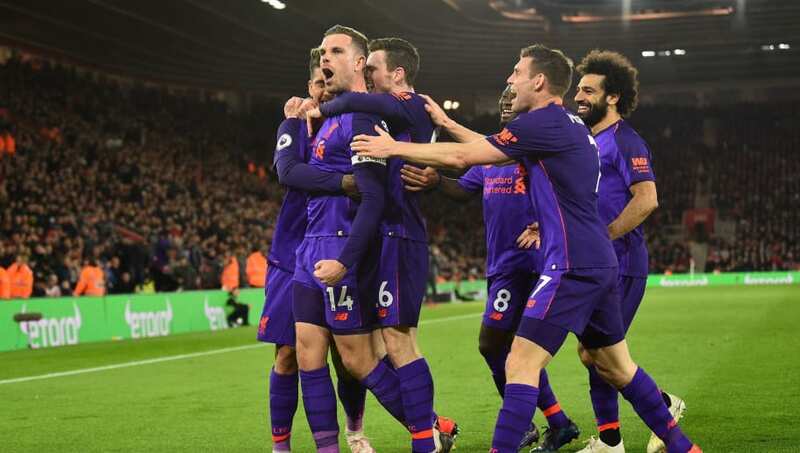 The hosts have not won this fixture since autumn 2016 when first half goals from Dejan Lovren and Jordan Henderson proved enough to overcome the Londoners. Unfortunately for them, that was just their second victory in their last 16 matches against Chelsea. Nevertheless, Klopp's team have the better overall record having claimed 77 wins over the course of history, going down on 63 occasions. The draw seven months ago was the 41st time things have ended all square. The league leaders have hit a rich vein of form at a crucial time in the season, winning their last six in all competitions. The most recent came on Tuesday night as Keita's deflected effort and Roberto Firmino's straightforward finish handed the side a healthy lead in the first leg of their Champions League tie with Porto. Their 3-1 triumph over ​Southampton followed league victories over ​Tottenham, ​Fulham and ​Burnley, all of which were matches where they had to show resolve to get the result. The two London clubs both pegged the Reds back with second half equalisers, whilst the Clarets took a shock lead at Anfield. The Blues have improved following a testing start to 2019. Maurizio Sarri had been under fire for his selections as well as the team's displays, though the pressure has eased with a string of positive performances. The Europa League win on Thursday night was their fourth in a row, that defeat of Slavia Prague coming after successes against West Ham, ​Brighton and ​Cardiff City. Their upturn in fortunes can largely be attributed to the scintillating form of Eden Hazard, the 28-year-old demonstrating exactly why ​Real Madrid are trying to lure him to the Bernabeu. Sarri's men have appeared sharper and more confident since the end of the winter and have an impressive record against Liverpool. Moreover, Hazard has been untouchable in recent weeks and tends to up his game when he plays the Anfield side. However, the Reds have garnered a reputation for grinding out results, displaying determination and grit as they overpower opponents. They have 30 years of heartbreak fuelling their title challenge, as well as the pain of Steven Gerrard's infamous slip in this fixture five years ago. They possess both the ability and mentality to overcome what is a sizeable hurdle in the shape of Chelsea; their mean defence and lethal tripartite attacking unit of Salah, Firmino and Sadio Mané should ensure a crucial win.